Seattle rock veterans Mudhoney kick their new CD, Since We've Become Translucent, off with an eight minute acid-jazz meets psychedelic rock song ("Baby, Can You Dig the Light?"). After the initial shock wears off, and track two, "The Straight Life", hits you, the old Mudhoney you love is back in full force with their guitar-driven, loud rock songs that sit somewhere between garage and pop. "Where the Flavor Is" is a smart, stylish garage rocker that seems to know its roots, but want so much more. With the addition of horns, the song manages to pull off more while still sounding stripped down and nothing but rock. "Our Time Is Now" finds the band taking a stab at blues-rock. 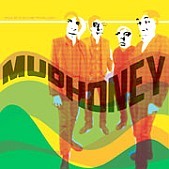 Taking cues from the early R&B rock acts, Mudhoney delivers the blues with a garage twist, letting you know they still want to rock with you, but that they want to expand your palette as well. If you want garage rock, don't settle for the imitators that seem to be coming out of the woodwork now that garage is all the rage. Go to the source, the band that has been playing loud garage rock for years all the while pushing the envelope on what garage can be. I'll give this a B+.